Telangana Assembly Speaker Sirikonda Madhusudhana Chary recently received a VVIP 'milk' treatment for announcing a new village council at his home constituency in Bhupalpally district. 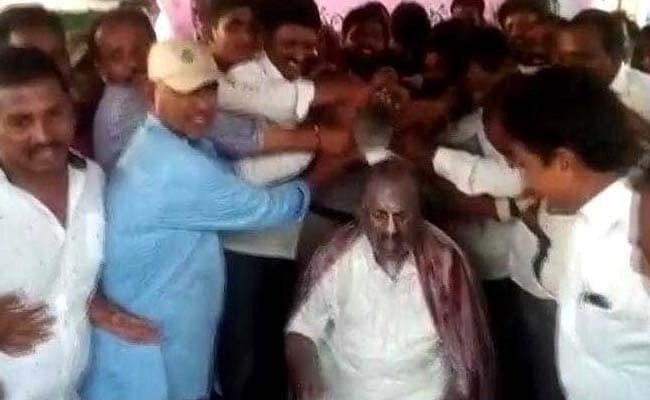 On Saturday, Telangana Assembly Speaker Sirikonda Madhusudhana Chary sat with his head bowed as supporters poured bowls full of milk on him - their way of rewarding him for announcing a village council at his home constituency. On video, Mr Chary was seen with milk dribbling down his head and neck for a few moments before he raised his hands to stop his supporters at the village in Bhupalpally, his constituency in Telangana. The "milk bath" is a tradition followed for "VIP treatment" in these parts. But the video provoked disapproving comments on social media. Many frowned at what they thought was appalling waste of milk. "Damn.... is it this hard to see the wastage.... Ironic making a fool out of themselves on April Fool's day...," was one comment on Twitter. "What a wastage of milk! You do realize Telangana has a lot of people who actually don't have money to afford it," posted another person. What a wastage of milk! You do realize Telangana has a lot of people who actually don't have money to afford it. "I didn't know that people from my state can come with this. Pouring milk on hero posters on big cinema release is norm here, but this is altogether in different league," said a Twitter user.